Still, Gov. Walker has hung tough and is leading in the polls. This has forced Team Obama to spend more millions and send in the big guns: DNC Chairwoman Debbie Wasserman Schultz is headed to Wisconsin. During my visits to cities across Wisconsin, I have chatted with numerous patriots who are elated and extremely grateful to Gov. Walker for displaying remarkable courage — fighting back the forces of evil to keep his campaign promise to implement responsible budget reforms. On this latest trip to La Crosse, Wisconsin, I heard a very disturbing tale from an 80-year-old businesswoman. For her safety, I will refer to her as Patriot Sue rather than using her real name. Patriot Sue's family business has been successful and highly respected since the 50s. But Patriot Sue wrote a local letter-to-the-editor in defense of Gov. Walker's reforms, and all "heck" broke loose — from false accusations in the media that she mistreats employees to threats against her and her family. Patriot Sue expressed to me her frustration that some people do not understand how recalling Gov. 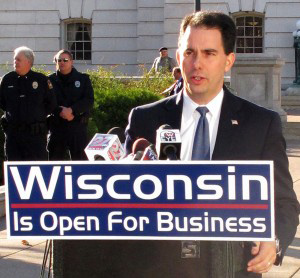 Walker would negatively impact their pocketbooks. I guess you cannot run a successful family business for over 50 years without having backbone. Though physically moving a little slow, Patriot Sue still has the spitfire of an 18 year old and the heart of a lion. She financially supports the defeat of the recall and still boldly speaks out in defense of Gov. Walker's reforms. You simply to do not tell this woman what she can or cannot do. But folks, what I find most disturbing is that we have "presidential thugs," in essence, emotionally threatening, and with threat of physically beating, an 80 year old woman and her family. What am I saying? I am saying it is all about Obama. Leadership flows from the top down. The late Mary Kay said, "The speed of the leader is the speed of the gang." Mary Kay's leadership and philosophy of God first, family second and Mary Kay Cosmetics third continue to inspire her army of successful businesswomen. Obama minions include the New Black Panthers and SEIU thugs who are the enforcers — intimating voters http://www.dailymotion.com/video/x7avsv_black-panthers-intimidate-white-vot_news and physically beating up black conservatives who dare be on the wrong side of Obama's agenda. Team Obama is using Chicago-style bullying to award Obama an undeserved second term despite half the country on food stamps, the housing market in the tank, unemployment through the roof and sky rocketing energy prices. Yes, four more years of Obama's liberal-utopia-politically-correct policies is exactly what America needs. To be re-elected, Obama is relying on class envy via crazy, absurd rants attacking the rich by VP Joe Biden to his dumbed-down base. http://americanpowerblog.blogspot.com/2012/05/joe-biden-unhinged-rant-against-rich.html Obama is relying on Al Sharpton and his "we be black victims gang" to inspire enough hate in the hearts of black Americans to get them to the polls in November. And let us not forget Obama's on-the-street enforcers such as the New Black Panthers and SEIU thugs. Obama minions take no prisoners. All are fair game, including a feisty 80-year-old businesswoman who dares to support Gov. Walker.